Oh yes, it’s coming! Tax season is around the corner and we need to get ready for it! I have to say it’s not my favorite time of the year. Even though I am an accountant, I dread this time of the year. It’s not the filing that causes me the headache, it’s the preparation before! I have to organize those receipts to maximize my return or reduce my tax bills! That’s just one of the biggest challenges during tax season for me. Tax season challenges vary as much as people do! I did a small survey with our readers. I value their opinions and wanted to know if they have the same tax season challenges as me. I also wanted to know what others faced at tax season time. Take a look at their answers! Getting organized. A common theme in the answers revolved around just getting organized. One reader said she had a hard time “finding all the papers, receipts etc and getting it organized!” Another reader told us that it was challenging to keep all the receipts and other information organized so it’s easier to find during tax season. Filling out the forms. Another common tax season challenge that we heard a lot about it difficulty with the forms themselves. One reader wrote that her biggest challenge is finding the right lines to put certain things and finding medical receipts, etc. Another had a difficult time figuring out where everything went. She said “I also always seem to lose or skip the spot where you input your ‘rent’.” Readers also found it difficult to figure out what’s deductible and what isn’t. Finding the time. Taxes are time consuming! Finding the time to do them seems to be a challenge many readers face during tax season. One wrote that getting her husband to help was her biggest challenge! Another wrote that it was difficult because she had several short-term jobs last year. Getting all the deductions. Readers find it challenging to make sure they’re getting all the right deductions, especially when they have their own businesses! So the biggest challenges are : organization, time, getting every deduction! How can we overcome them? Have a folder for your tax receipts. It can be also a shoe box (I prefer this Smead All-in-One Income Tax Organizer, 12 Pockets, Flap with Elastic Closure, Letter Size, Navy/White (70660) folder). Each time you get a receipt for tax purposes: be it restaurant, phone bill, receipts for kids that may entitle you to a deduction: put in there! Have en electronic folder for your tax receipts: during this digital era, most of the receipts are online. As soon as you get them, file them in a folder! Easy! Once every 2 weeks, remove all the receipts from your car or your purse! Everybody does this and keeps them there, so don’t try to pretend you don’t! I usually go into my husband’s car and find receipts in there! Don’t forget them. You will kick yourself later! Once a month or even 2 months depending on the number of receipts you have: organize this physical folder (or e folder) or shoe box into separate folders with proper labeling: one for the phone bills, one for interest rates, etc! It’s a life saver at the end of the year! Then have a spread sheet by type of expense and write down all the amounts! Let your older ones help you! My son is happy to do that for me. He learns Excel and is proud! This is great because it also helps you stick to your budget as you can see how much you’re spending on extras. Since you gathered all your receipts, you will certainly optimize your return. But you may forget some deductions! I highly recommend using a tax software to do your taxes. They have a step by step questionnaire that will enable you to optimize your return! Those tax software programs also help you make sure you’re filling out the forms properly, taking care of two tax season challenges at once! 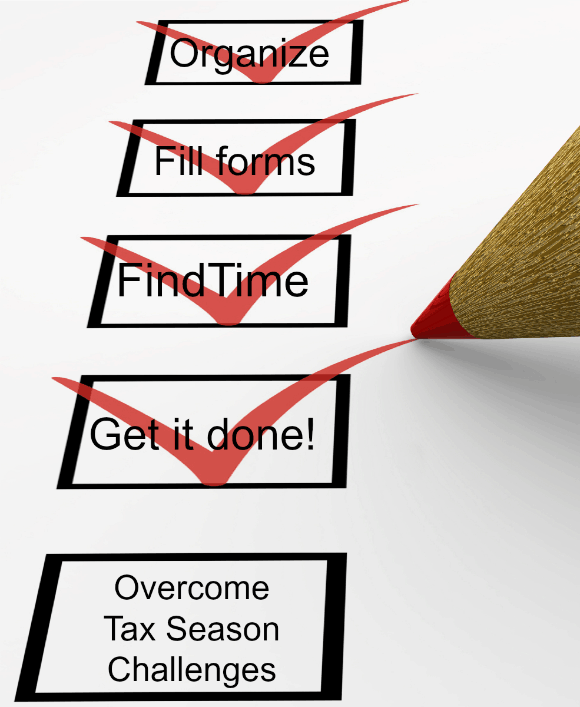 With a little organization throughout the year, you can make sure you don’t face any tax season challenges next year! It’s not too late though for this year. It may take a little extra time, but you can do it! Pros & Cons of Lamaze: Will it Really Help You with Labor Pain? The Canada Revenue Agency (also known as CRA) mandates that taxes be filled within April every year for most people. For those who are self-employed, they are afforded time up to June. This is generally the time of the year when people are in a rush to prepare their statements, file returns and pay any amount due from the last filling to the government. This is particularly the time when people crave for some professional help from various tax preparation services in Canada. But as often observed, people fail to comply with the regulatory requirement, drawing the ire of the CRA. Tax lawyers claim that as many as half of the population do not generally complete their returns well within the deadline and many haven’t filed returns for years. You are so right about it being challenging to make sure you’re getting all the right deductions. In fact, we’ve been going through this process around here lately and I learned the very good lesson of keeping everything more organized this year! Making time is the biggest thing. Everything else is really quite simple. tax season is really a stressful one but if you know how to handle it, you will definitely get through it without any hassle. There’s so much to collect and so much to pay when you blog. It’s always good to be prepared and time saving options matter a lot. Thanks for this post, such a headache! Hello tax is really difficult and I just can’t get my head around maths but this is a really good of tips so thanks for sharing. These are great tips.It seems no one likes tax season. I hate tax season with a passion, not because of paying them (although that does stink) but because of the paperwork involved! I think the best way to overcome tax season stress is to dedicate enough time to tackle the task. I know it is such a daunting task that we tend to put off, but it would be always best to do it early and not procrastinate. Thanks for the tips! Taxes gave me a headache sometimes. Really good tips and information. I thank god all the time that I am married to an accountant! He LOVES doing taxes, too – crazy, right? LOL. Thankfully I don’t need to do Tax yet but such helpful ideas thank you! It’s important that you have everything in one place so you don’t have to waste time looking for files and folders to help you out. These are nice tips! Ready to do mine just waiting on some more tax slips. Tax time can be such a headache! You gave some great tips in your post! I am working on mine! And I have some new endeavors in the past year, so it is a learning experience for me. I go to get my taxes done in 2 days and I am starting to freak out! I really need to get stuff organized QUICK! Thanks for the tips, they are just in time! Thankfully my taxes are quite easy to manage and takes very little time to complete. Your Social Insurance Number May Be Stolen by Heartbleed: What Can You Do?